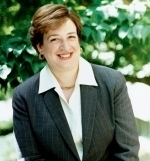 I am in high spirits because on August 7, Elena Kagan was sworn in as our fourth female Supreme Court Justice – bringing the number of women currently sitting on the bench to three. I was fortunate enough to meet the first female Supreme Court Justice, Sandra Day O’Connor in 1990, when I was doing a Congressional Fellowship on Women and Public Policy on Capitol Hill. I remembered I asked her how it was to be the only female on the Supreme Court and she told me that it was fine, though it would be nice to have another woman Justice. In 1994, I met the second female Supreme Court Justice, Ruth Bader Ginsburg, shortly after she was sworn in. I told her that I knew Justice O’Connor was happy to have some female company on the court. Indeed in 2007 when Justice Ginsburg was the sole female, she told USA Today that she was “lonely” after O’Connor’s retirement. Why is three women sitting on the Supreme Court Bench significant? For one thing, according to the US Department of Labor, Women’s Bureau, “Supreme Court Justice” is no longer a non-traditional job for a woman (the threshold is 25%.) According to the sociological literature on “tokenism”, 25% is the tipping point for when a minority no longer is a minority. And according to a study by Catalyst, three is the magic number in which women can effect change on corporate boards. As much as I love women pioneers, it makes me even happier when it becomes “normal” to have many women in a career field. Feeling “normal” encourages women to speak up, bring their unique perspectives into the workplace, and make a difference — regardless of whether that field is law, technology or the trades. When women make up at least 25% of a field, or a board or, in this case, the Supreme Court, they are visible role models, they bring other women into the field and they serve as mentors for the next generation. So now it is no longer unusual to have a woman Supreme Court Justice and, hopefully in my lifetime, we will even have a female Commander-in-Chief or two. Let’s aim for at least one-third women in all fields, to make for a richer workplace and an enriched society. To read more about my perspective on why it’s important to have women in all occupations, please feel free to read and share my new article, Why IWITTS?.